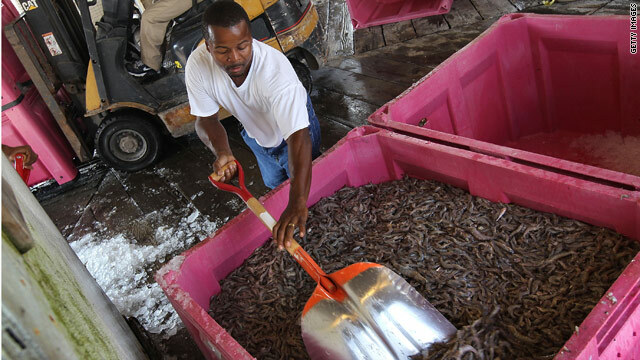 Stanley Johnson packs fresh shrimp for shipping May 18 in Port Sulfur, Louisiana. New Orleans, Louisiana (CNN) -- A fisherman who was hospitalized after becoming ill while cleaning up oil in the Gulf of Mexico has filed a temporary restraining order in federal court against oil company BP. John Wunstell Jr., is asking BP to give the workers masks and not harass workers who publicly voice their health concerns. Wunstell, a shrimper, said he was paid by BP to use his boat, Ramie's Wish, to clean up oil that has been gushing into the Gulf since an oil rig sank about 40 miles off the Louisiana coast, gushing an estimated 19,000 barrels (798, 000 gallons) of crude a day. In an affidavit, Wunstell wrote he started experiencing severe headaches and nasal irritation on May 24. Over the next few days, he also developed nosebleeds, an upset stomach, and aches. On Friday, Wunstell was airlifted to West Jefferson Medical Center in Marrero, Louisiana, where he remained hospitalized Sunday. Eight other workers were brought to the hospital this week and were all released. "We need to start protecting these guys," said Jim Klick, Wunstell's lawyer. In his affidavit, Wunstell described his experience at the hospital. "At West Jefferson, there were tents set up outside the hospital, where I was stripped of my clothing, washed with water and several showers, before I was allowed into the hospital," Wunstell said. "When I asked for my clothing, I was told that BP had confiscated all of my clothing and it would not be returned." The restraining order requests that BP refrain from "altering, testing or destroying clothing or any other evidence or potential evidence" when workers become ill. He denied accusations from Clint Guidry, president of the Louisiana Shrimpers Association, that BP has been threatening workers who speak out about health concerns. Fishermen contacted by CNN have declined to speak publicly. Some, who are making as much as $3,000 a day cleaning up the oil, have said they fear losing their jobs with BP. "The BP oil spill wiped out their professions and their jobs this year and possibly years down the road," Klick said. "The only work they can get right now is with BP." The BP spokesman said there have been no threats against workers for speaking out. "If they have any concerns, they should raise them with their supervisors," MacEwen said. "They can also call the joint information center and make complaints anonymously." Wunstell is one of nine clean-up workers who were sent to the hospital with symptoms such as shortness of breath, nose and throat irritation, headaches, and dizziness. The restraining order requests that BP stop using dispersants without providing "appropriate personal protective equipment" to workers. Corexit, a dispersant, is being sprayed into the Gulf to break down the oil. The safety data information sheet from the manufacturer states that people should "avoid breathing in vapor" from Corexit, and that masks should be work when Corexit is present in certain concentrations in the air. BP has not supplied workers with masks when they work near the oil and dispersants. "We're been carrying out very extensive air quality since early on in this exercise, to make sure that we have working safe conditions, and thus far not found situations where there are air quality concerns that would require face masks," MacEwen said. He added that workers who want to wear masks are "free to do so" as long as they receive instructions from their supervisors on how to use them. According to Guidry from the shrimpers' association, BP told workers they were not allowed to wear masks. "Some of our men asked, and they were told they'd be fired if they wore masks," he said. "Headaches, shortness of breath, nosebleeds -- there's nothing there that suggests foodborne illness," said Dr. Michael Osterholm, a professor at the University of Minnesota School of Public Health. "I don't know what these people have, but it sounds more like a respiratory illness."